LiverBiotix™ contains a unique triple combination of silymarin from standardised milk thistle extract, choline and Lactobacilli bacteria. Choline may help contribute to the maintenance of normal liver function. This product has been encapsulated in acid-resistant DRcaps™. DRcaps™ are designed to delay the release of the active ingredients, reducing the exposure of the sensitive probiotic bacteria to the acidic environment in the stomach and releasing these ingredients directly into the intestine. 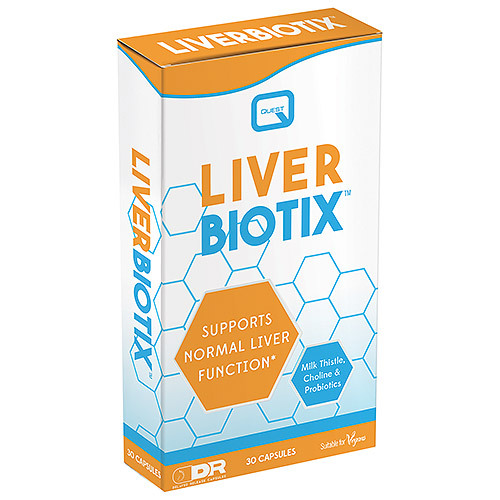 LiverBiotix™ has been designed to support overall liver health, as well as to help support and protect liver function. It combines milk thistle extract, containing silymarin (and its active constituent, silybin), choline and probiotic lactobacilli bacteria in a single dosage form. Silymarin (from milk thistle extract), has a long standing traditional use. Choline is a key nutrient in the support of normal metabolism and transport of fats (lipids) in the body. Probiotics have a key role in helping to support and protect the liver and supporting the barrier function of the gut and by helping to support the reduction of bacterial overgrowth of gram-negative bacteria. Choline bitartrate, milk thistle (silybum marianum) fruit extract, bulking agent: microcrystalline cellulose, lactobacilli culture, magnesium stearate, capsule shell (hydroxypropylmethylcellulose, gelling agent: gellan gum). Take one capsule with or after a meal. Swallow with water. Below are reviews of Quest LiverBiotix - Liver Function - 30 Capsules by bodykind customers. If you have tried this product we'd love to hear what you think so please leave a review.